The forests that belong to the case study area are a part of the territory of the State forest enterprise “Panagyurishte”, which cover forest lands of two municipalities – Panagyuriste and Strelcha. The name of the case-study area has the name of the main town in the region – Panagyurishte but, the forests of the case-study area are part of the territory of the Strelcha municipality. The municipality of Strelcha is situated in a small valley in low mountain region called: Sashtinska Sredna Gora in Western Bulgaria. In the municipality of Strelcha, where is the case study area, permanently reside 5,600 people (25 people per sq.km), who are largely dependent on the adjacent agricultural and forest areas. (Fig 2). The extraction and processing of copper in the region is a leading activity in the local economy. Fig1: Map of the case study region. The area is part of the district with an administrative center Pazardzhik, famous for the production and processing of food. Globally, the Pazardzhik region occupies the Northeastern part of the geographical area of Upper Thrace. The district covers the Thrace basin of Maritsa River, whose mouth is in the Aegean Sea. The population in the area is about 280 000 people (62 people per sq.km), concentrated in lowland areas suitable for agriculture. Agriculture and tourism are the main economic activities in the mountainous areas of the district. 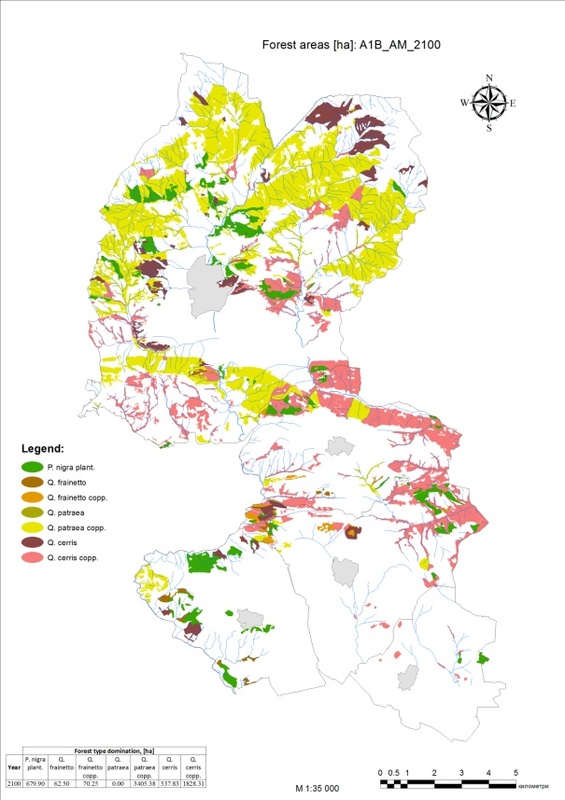 The forests in the case study region are primarily owned by the state with less than 7% in private ownership. The most significant part of the coppice forests in the lowland areas are owned by the municipalities. (fig.3). They are relatively large owners and they are required to manage the forests under the same rules, as the state ones. The regulatory framework applies to both public and private forests. 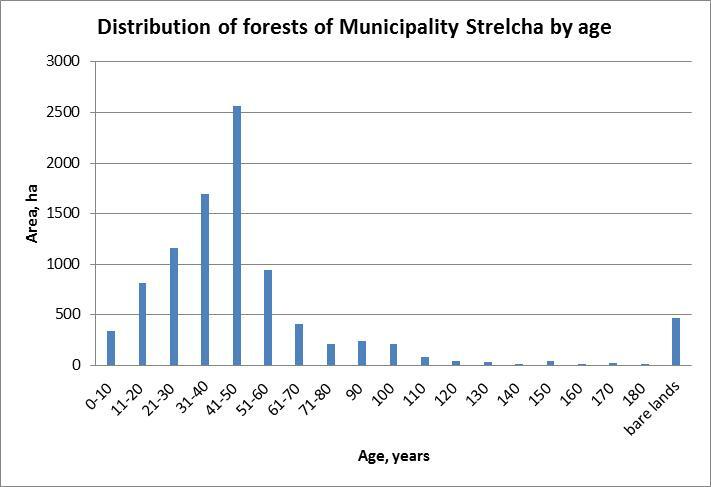 Fig 3: Forest ownership structure in the municipality of Strelcha (source: Forest management plan of SFE Panagyurishte, 2006). The forestry territory falls within the transitional continental region in the European sub-continental climatic zone.In the region rainfalls are comparatively small and often there are periods of drought lasting over 10 days.The location of the case-study area implies minimal Mediterranean influence, typical for areas around the valley of the Maritsa River. Strelcha is characterized by a moderate altitudinal gradient from ca. 400 m up to 1000 m at the summit of Smilovene (the name of the pass through the Sredna Gora mountain). This represents one vegetation belt, where the vegetation composition is changing smooth following the temperature and moisture gradient and depends stronger of the exposition, than the altitude. 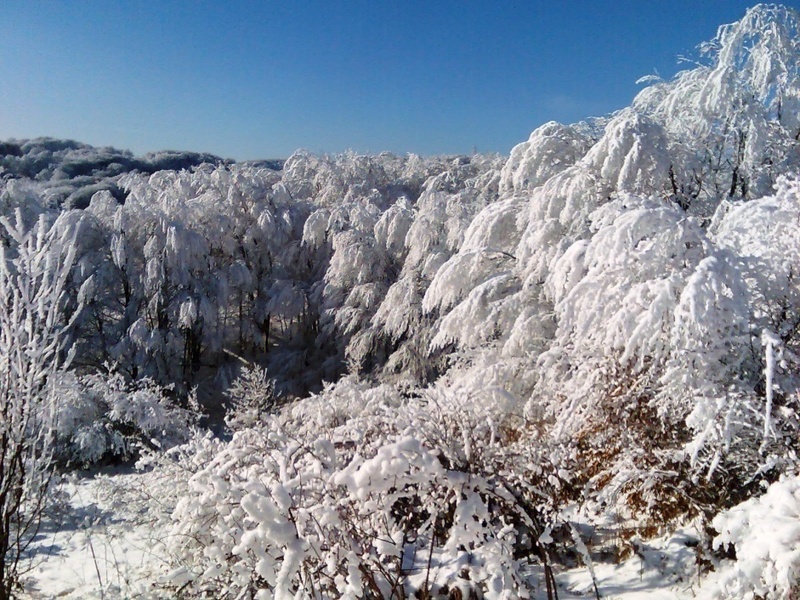 The average altitude is 650 meters and the forest land is characterized by relatively medium slopes, inclination – 21o – 30o. The case study area is characterized by a sandstone bedrock which weathers easy and makes the base of the cinnamonic forest soils (Chromic luvisols), which occupy 76.7 percent of the total forested area. The climate is typical temperate-continental. The mean annual temperatures are 10,6°C. The average January temperatures run about-1 °C. The absolute maximum temperatures are 34oC – 36oC. 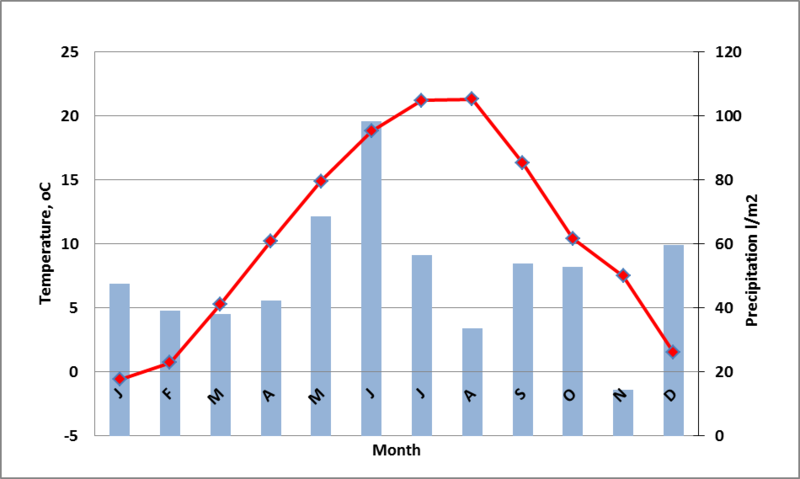 The total mean annual precipitation is 60 l/sq.m (600 mm) with a late spring maximum and summer minimum (fig.4).Often there are periods of drought lasting over 20 days during the second part of the vegetation period (August, September). The expected climate change features a distinct increase in temperature. The range of the expected temperature increases in the available regional climate change scenarios is 1.5 to 3.5 °C ,during the second part of the 21st century. Major changes are expected for precipitation, whose amount will lightly decrease between 60 up to 120 mm, e (Figure 5 and Figure 6). The most expected Impacts of climate change on this region are drought stress to trees and an increased risk of fire. Fig 4. Climate characteristics of the weather station Panagyurishte(540 m asl) Source: Institute for Meteorology and Hydrology, dep. Pazardjik. 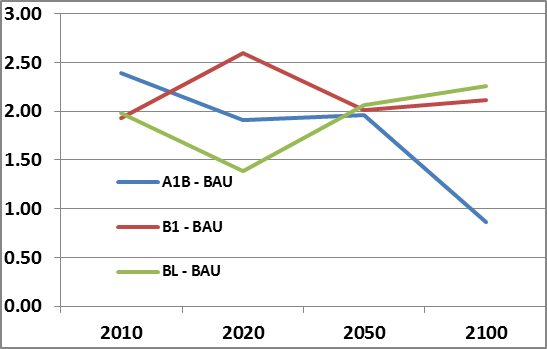 Fig.5: Expected temperature increase for the 21st century according to climate change scenarios A1B and B1 as provided within the MOTIVE project (based on CLM/ECHAM5 data, for more information please see Zimmermann 2010, and MOTIVE D2.2 Climate and land-use data). 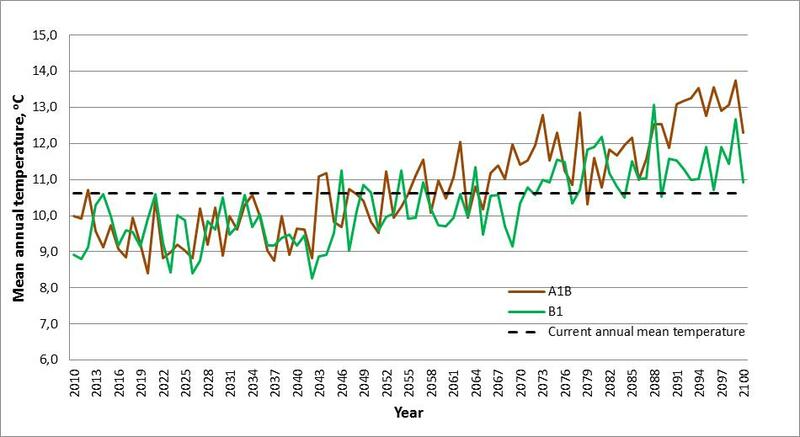 Fig.6: Expected precipitation changes for the 21st century according to climate change scenarios A1B and B1 as provided within the MOTIVE project (based on CLM/ECHAM5 data, for more information please see Zimmermann 2010, and MOTIVE D2.2 Climate and land-use data). 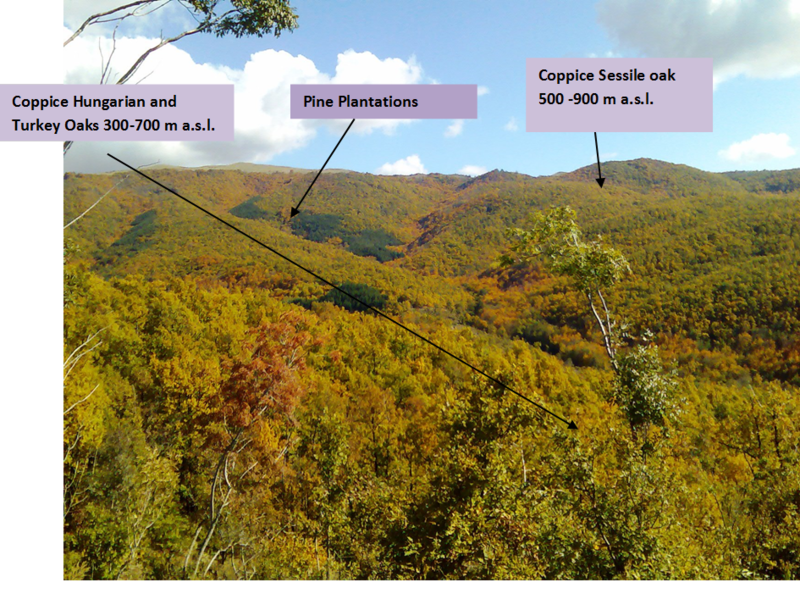 This case study looks into traditional coppice forest management versus transformation into high stands and restoration of the native tree species under man made conifer plantations. In addition, landscape improvement and recreation will also be studied in the case. The coppice forests in this case study region are conservative. The native forests are two centuries old, and they have at least 3-4 rotations. By each logging, the root system is damaged but remains with the same origin. This decreases the stability of the remaining trees. After several coppicing, oaks renew only the parts of their above ground biomass, since the root system is permanently aging. Generally, the dimensions and quality of the timber is not proper for construction and furniture. The fire risk is increased by the presence of coniferous plantations which are not thinned regularly as well by the existing abandoned agricultural lands covered by tall grasses. Another prerequisite for the occurrence of fires is the implementation of the old practice of burning stubble, which is forbidden by law, yet still happens. According to their management functions, some 10% of the forests have a primary function different from wood production (fig. 7). This means that the forests should be managed without any additional restrictions, only following the 10 years management plans, based on the principles of sustainability, landscape improving and maintaining the continuous forest cover. The number of forest stands in the case-study area is 1200. Of theme, 93 were selected as representative, in which detailed measurements were made. The selection of representative stands is consistent with their age and coveres forests of four different age groups as follows – 0-20 years, 21-40 years, 41-60 years and over 60 years. This choice is based on data of forest age distribution (fig.8), from which it is clear that the majority of the forest stands are at the age when they will have silvicultural treatments that will determine their future origin and composition.The coppice oak forests in the region are all in the management group for conversion into high forests by over maturing – usually after 50 years for Turkey oak and after 55 years for sessile oak, but after 60 years for Hungarian oak. The differences in rotation length are based on the ability of different over mature coppice trees to start producing acorns. 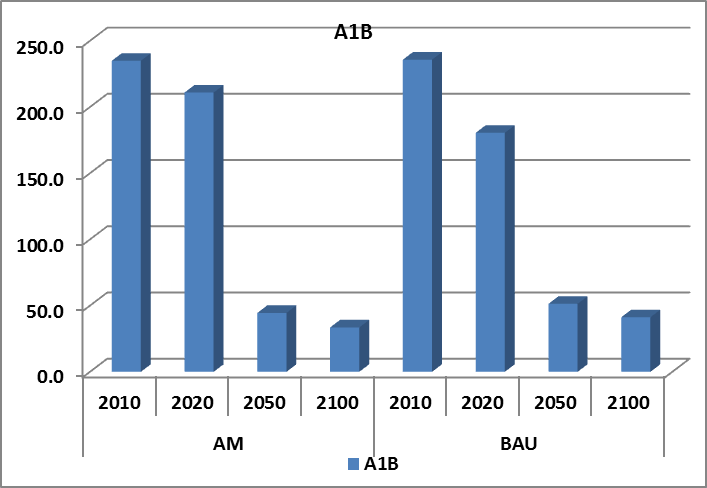 Fig.8:Age distribution of the forests of the case study area Pangyuriste. Typical 60 years old mature coppice stand, dominated by Turkey oak. When no tendings are applied after final felling, sprouts shift seed saplings as it shown in that stand dominated of Hungarian oak (Quercus frainetto). The range of stakeholders involved in some capacity in this case study reflects the importance of the forests to their livelihoods or leisure. The forests of the State forest enterprise “Panagyurishte” serve as sources of fuelwood for local citizens. The grazing rights were more important during the past, but they are still significant for some local farmers. The public sector stakeholders include the state and regional forest authorities, as well as the Municipal Council and The Church Board who also own forests. The protective functions against rockfall and landslide, debrisflow and erosion, are huge and public forest departments are responsible for maintaining them.Further regional organisations that have an interest in protecting the forests include the police and ‘Fire, safety and rescue’ regional directorate. Due to the abandonment of much agricultural land used for hay and pasture, it becomes very quickly overgrown with bushes and in drought years fire can spread very easily including neighbouring forests. A key private sector stakeholder is a mining company, a major employer but also one that creates environmental problems through pollution. Non-governmental stakeholders represent recreational/tourist and small scale livelihoods. Hunters as another influential stakeholder group are represented by the local hunting brunch of the national hunting organization. During the last few years more of the stakeholders groups are most concerned by the current economic crises,which has resulted in decreasing or postponing investments. Figure 9 displays the distribution of regional stakeholder preferences regarding a set of forest ecosystem services. In general, the environment functions as recreation and clean air production are distinguished as key forest ecosystem services. 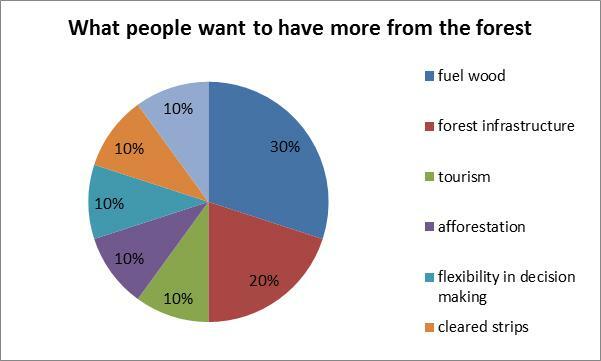 Fuel wood demand is leading between the services which are not enough, according to the opinion of stakeholders (fig.10). The people are not satisfied with the available forest infrastructure, regarding the forest roads quality and density-net. 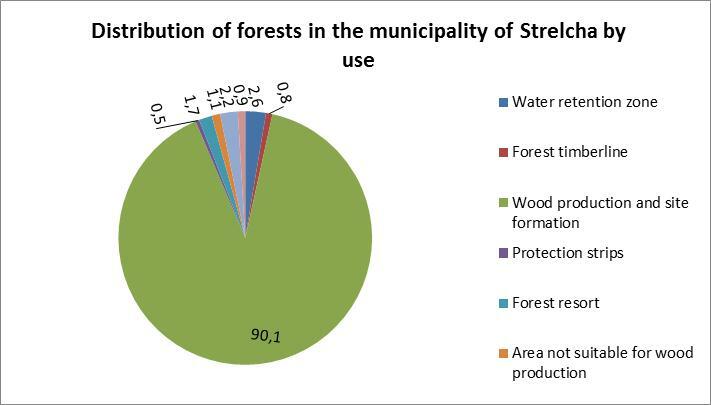 Fig.9:Numbers of answers of local citizens of Strelcha municipality on the question: What is the most important way the local forests serve to you? 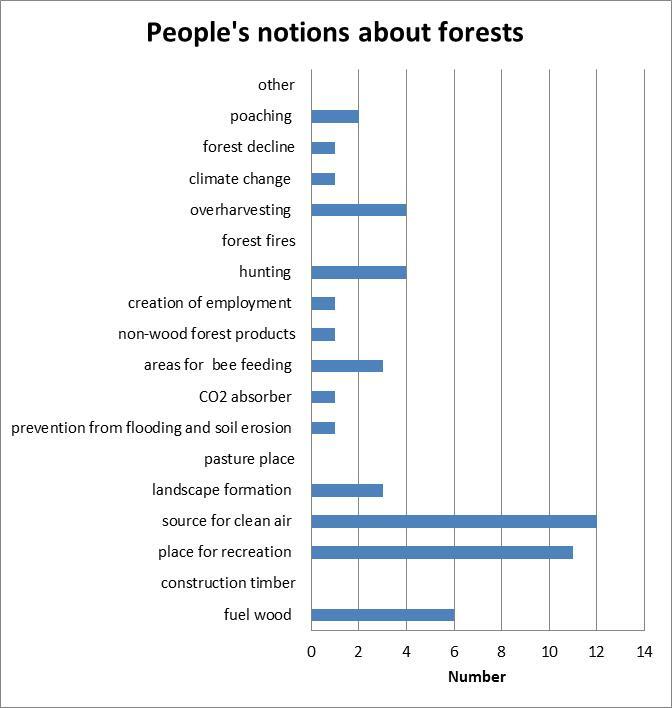 Fig.10: Relative people’s opinion about: What is not enough from the local forests? 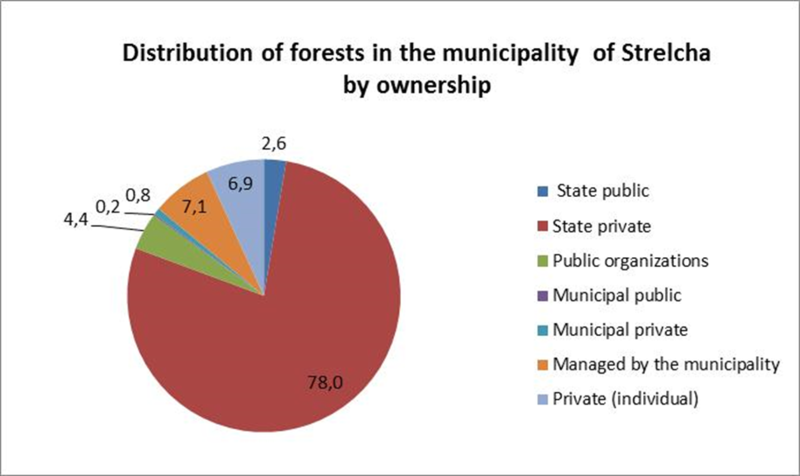 Overall in Bulgaria the state owns 76% of the forests whilst municipalities or the church own 10% and 13% is divided between 2 million private owned forest land parcels. 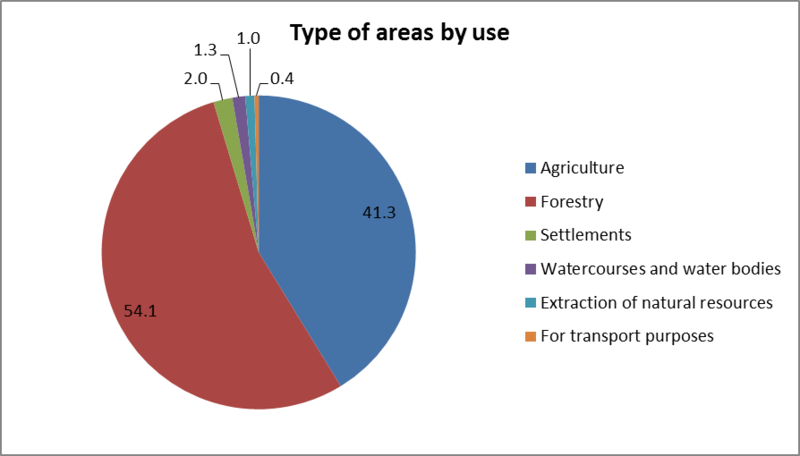 The forests in the case study region are primarily owned by the state with less than 7% in private ownership. The regulatory framework applies to both public and private forests (there are no local or regional forest policies). However, differences in management of forests are evident in the case study with small private owners practicing clear-felling, while large state or municipal owners are concerned with converting coppice stands into broadleaves, which excludes clear-cutting. The state forests are managed on-site by State forest enterprises that fulfil long-term economic objectives set out in management plans and which are obligatory. However, forest management activities are carried out by private contractors. Much of the coppice forests in lowland areas are owned by municipalities. They are relatively large owners and they are required to manage the forests under the same rules. In most cases this is observed, but usually they don’t implement tending and thinning after the final felling phases. Activities of the municipal forest structures are controlled by the Regional Forestry Directorates. Very often, their management depends on the political agenda of the day, but the trend is increasingly to follow the contemporary silvicultural regulations. Private owners usually own the smallest parcels of often less than 1 ha of forestland. Many of these properties were formally agricultural lands that were converted to plantation forests. They are valuable and owners are obliged to use the land as a forest rather than a farmland. Following restitution of land to former owners, the ‘new’ owners are usually relatively detached from the property of their forefathers and often try to gain short term income from that property without having a long-term business vision. This can lead to the application of clear cutting in their coppice forests. Legislation states that 2 ha can be clear cut but you can only do this once. Following clear-cutting, the forests remain as coppice, but with less density (and hence less productivity) because the density of coppice over-mature stands is less than those of typical coppice forests which have an interval between coppicing of 20 – 25 years.Many of the existing conifer plantations were created for landscape purposes, especially along roads.Austrian pine (and, rarely, Scots pine) plantations have been established to increase the productivity of former coppice forests in bad (dryer) soil conditions caused mostly by overgrazing or as a protection measure from erosion of individual catchments. These plantations will play a pioneering role and will subsequently be transformed into mixed forests dominated by native species. However, since the production potential of sites is usually relatively small, to survive for a long period these plantations require intensive thinning. This usually does not happen and plantations often suffer from natural disturbances, and in open gaps native vegetation gradually returns. Any regeneration felling then will be supplemented by natural regeneration of local deciduous species. Expert prediction is that no more than 10% of current pine plantations on coppice oak sites will remain as pine in next generations on poorer and drier sites. Coppicing is a key part of forest management and has a long tradition in the Balkans as well the whole Southern part of Europe. In the early to mid 20th century, forests in the region served the basic needs of the local population providing firewood and a place for grazing livestock. Grazing was restricted to bare lands after coppicing with a rotation period of 25 years, and it was again permitted when new sprouts were at least 10 years old. However, in many cases these restrictions were not observed. Nowadays, stands in the case study area are composed mostly of coppice oaks, since more of the other native tree species were not vital to long-term coppicing. After the WWII and with nationalisation, almost all coppice forests underwent another coppice rotation, which put them to one age group. Following this, the concept of a longer rotation period was introduced. Currently, forests are used as a source of pulpwood, technology wood and firewood. From the best sites, small quantities of construction timber are also obtained, which can be used to produce flooring, woodwork, barrels, etc. Conifers are used mainly for producing small quantities of pulpwood and construction timber for local construction needs. Where stands are not in regeneration, grazing of domestic animals (except goats) are allowed, as their numbers has significantly decreased and they are not considered to be a major problem. Forestlands are also used for local tourism, the local population collect non-timber forest products such as mushrooms and herbs. Periodically,some events are hosted in the meadows in the high parts of the case study area. Hunting and game management exists but is not very well developed. Forests have an important water and soil protective service, since they occupy semi-mountainous areas with long and steep slopes. Forests play important protective and water-regulation role. Are the tree species in the forest sensitive to climate change? The assessment of tree species sensitivity to climatic changes in the case study distinguishes three key ecosystem processes (a) growth, (b) regeneration and (c) mortality of trees with regard to three time horizons: (i) short-term (up to 2020), (ii) mid-term (2020 to 2050) and (iii) longterm (2050 to 2100). All tree species in the region will actually physiologically fall out because of the drier climate and the water supply on most sites is a limiting factor (current precipitation levels will decrease up to 120 mm per year and T will rise up to 3.5 degree C which increases the evapotranspiration). The droughts and less favorable growing conditions during the growing seasons cause substantial decrease of the mean annual increment of the forest stands (fig. BG-1). In the short-term scale, not severe changes are expected. Mid-term seed regeneration will be still possible for most of the oak coppice stands (which is the important management goal). In long-term, the ecological conditions will worsen seed regeneration since the mature oak trees need favorable climatic condition to produce vital acorns. Young seedlings of seed origin will be more sensitive to drought stress and will be shifted by the young sprouts, which ability to provide more water through their old and well developed root system is higher (fig.BG-2). Fig.BG-2. 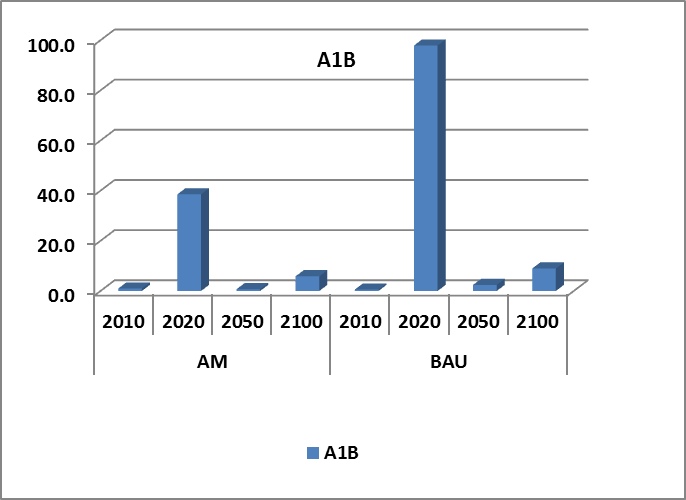 Distribution of forest stands in case study by origin for the two climatic scenarios (A1B & BL) following BAU management scenario. Due to the warmer and drier conditions some shortening of the current vegetation period will occur and the more xerophytes tree species will be less vulnerable. More valuable, but mesophyte Sessile oak (Q.petrea) will be most affected by long lasting, dry conditions. Warmer and open winter could provoke earlier blossoming of trees’ buds which could cause damage from later frosts. 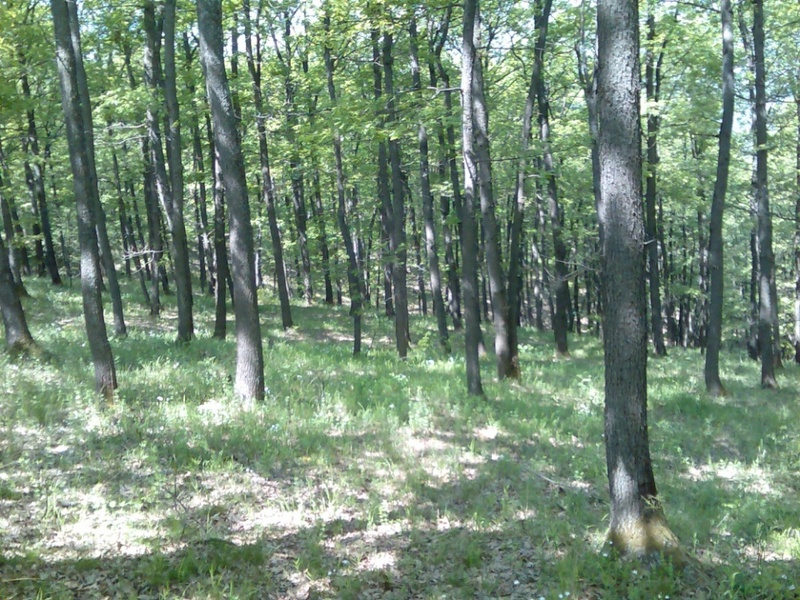 Constant short vegetation period will lead to a decrease of growth of the existing trees and a reduced stand’s canopy. These will increase the risk of epidemic outbreaks caused by insects, fungies and forest fires as well. The Hungarian oak (Q.frainetto) is the most drought-resistant species in the case study area, followed by Turkey oak (Q.cerris). 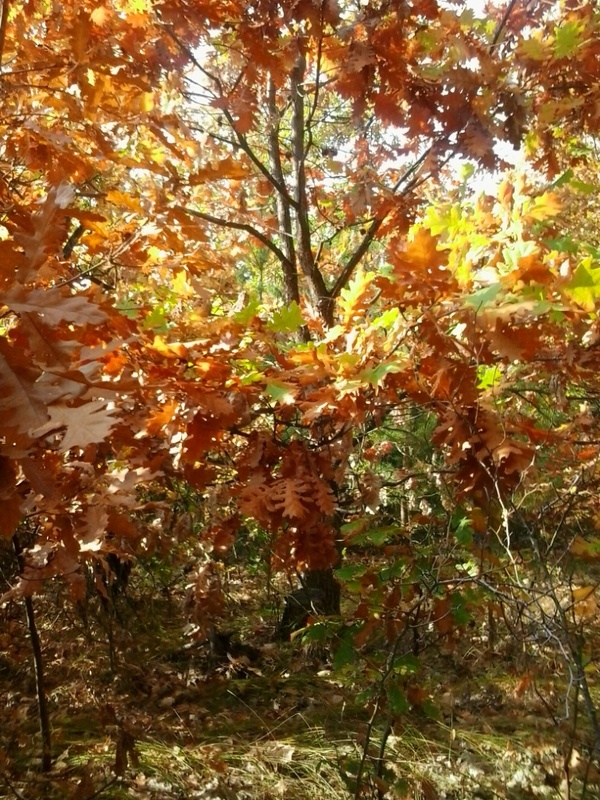 An important difference between them is that H.oak has a relatively slower growth in the beginning (lag in mixed stands) and reaches a mature phase at least 15-20 years later than Turkey oak.These leads to a permanent increase of the share of the more drought-tolerant and adaptive Turkey oak, which gradually replaces Sessile and Hungarian oaks during all periods of time (fig.BG-3 and BG-4). For pine plantations the risk of forest fires will increase substantially. Reduced precipitation and warmer temperatures may positively affect the conditions for Thaumetopoea pityocampa Schiff. and thus deteriorate the growing conditions for pines. From the other side, the Austrian pine (Pinus nigra) is competitive in dry soils. Fig BG-3. 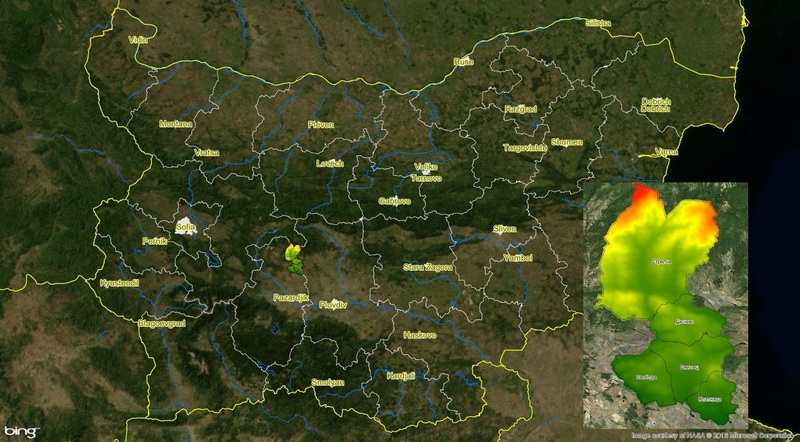 Species and origin dynamics of forest stands in the the case study Panagyurishte by moderate climate scenario A1B and BAU management (Year 2010). Fig BG-4. Species and origin dynamics of forest stands in the the case study Panagyurishte by moderate climate scenario A1B and BAU management (Year 2100). More of the pine stands should be harvested in mid-term run and pine will regenerate successfully together with some oaks. Looking long-term, about half of these future mixed stands will not be dominated by pine. Flowering ash (Fraxinusornus) and Eastern hornbeam(Carpinusorientalis) will be more often a part of the tree species composition as provisional species. For a summary of the tree species’ sensitivities please see Table BG-1. 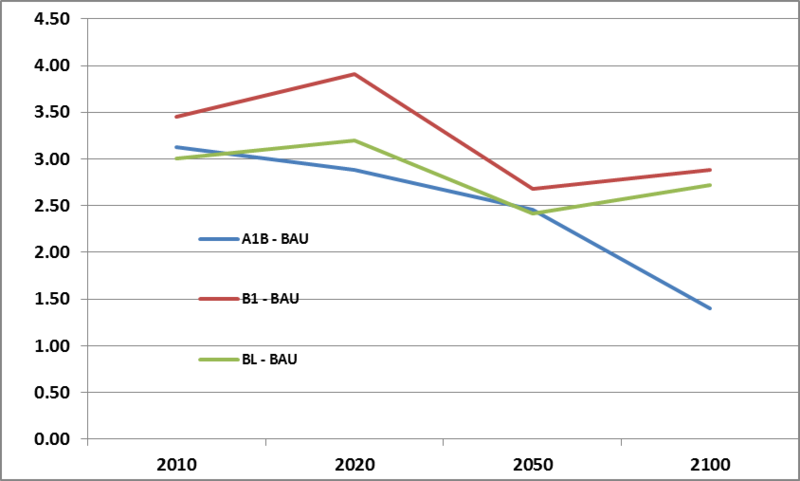 Assume that current management (BAU) is continued: Is it possible to achieve current goals also under climate change conditions? The formal overall goal of the State forest enterprise “Panagyurishte” is the sustainable and profitable use of the forest resources for all possible demands of society. Operationally, this includes the fullfilment of fuel-wood demands and the production of timber to create revenues. The maintenance of the water catchments of the forest areas, the protective services against erosion, and the protection of the woody, and green landscapes of the slopes around the settlements and agricultural lands, is part of the present management aims and responsibilities of the local forest department. The current management practices (business as usual; BAU) rely on the conception of converting existing coppice stands into high trough natural regeneration, which will increase the quality of producing timber and will ensure higher productivity in a long-term view.Since these stands are planned for seed regeneration, regular thinning is required until they reach maturity.Regeneration felling is shelter-wood implemented in two or three phases. Mandatory tending should be done after the final stage to suppress competition from new sprouts from the stumps of felled trees. If the latter tendings and thinings are not done (for example, because of lack of funds), then the future young stand will remain with a mixed origin and more sprouts will appear. Traditionally, the forests practitioners look at the man-made pine plantations as temporally stands which will produce some construction wood and after they reach rotation age of 60 to 80 years, will be partially or fully replaced by native trees (oaks, hornbeams). In short-term run all oak stands will not change vastly their silvicultural records. The pine plantation will be harvested more intensively, which will continue at some period after 2020 (fig. BG-7&BG-8). Mid-term projections suggest an intensive timber harvest from the coppice stands, reaching double quantity of the present level (fig.BG-6). If this will not be done many uncertainties concerning future existence of all over-mature coppice stands will occur. The natural tree dyeback will be a precondition of fires or insect calamities.There will not be available timber from conifers (fig.BG-8). The average timber volume per hectare will considerably decrease .The trees’ cover will be more sparse and open, and individuals will be younger and smaller. Thus, some other ecosystem services as erosion protection and landscape improvement will become more vulnerable. The long-term outlook is even worse .The stands will grow very slowly and both oaks and pine stands will be able to supply small amount of timber. The main goal to increase coppice transformation will not be reached. The area of the coppice stands remains the same as the current one (fig BG-5) and the main annual increment of the high oaks (fig.BG-9) keeps lower than the coppice ones (fig.BG-10), according to all climate scenarios. The Carbon sequestration regime may also have a negative impact caused by a higher fire danger and the slow growth of the trees. However, due to a higher share of the standing deadwood caused by natural die-back and more open tree cover, the habitat and biodiversity functions for different mammal species (rodents, foxes, some wild boars) are expected to improve. On the other hand younger forests will not receive hospitality to endangered (late successional) species, which depend from old and heterogeneous forest stands (table BG-2). Fig.BG-6. 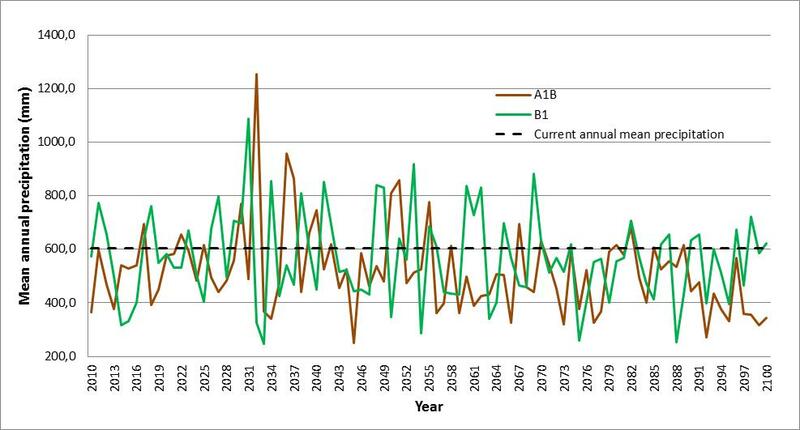 Current and projected 10 years average removed timber volume per ha from the coppice oak stands under moderate climate scenario A1B, AM and BAU management. Fig.BG-9. 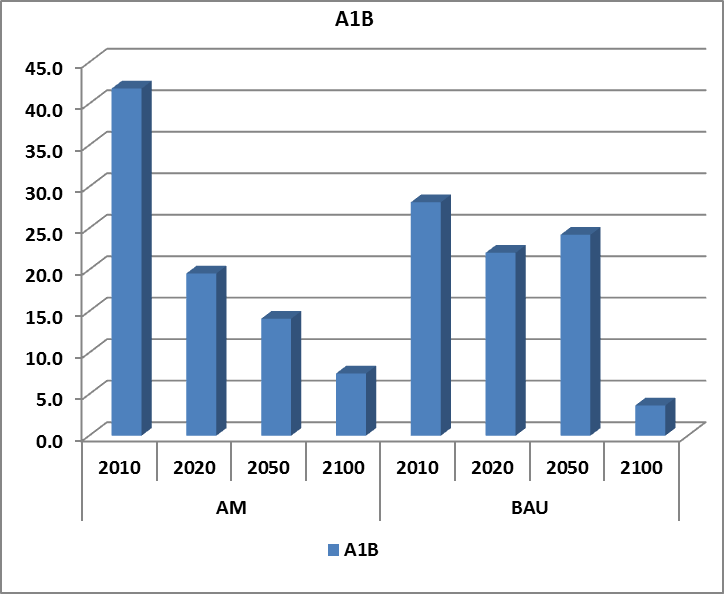 Average annual increment (cub.m/ha/year) simulation data for the high oak stands by climate scenarios (A1B, B1, BL) and BAU management scenario. Table BG-2. Impacts of expected climate change on different forest ecosystem functions in the Panagyurishte case-study (+ positive impacts, – negative impacts, ~ indifferent). Which adaptive measures appear as a suitable response to the changing climate in order to sustain the provision of the demanded ecosystem services? What is the recommendation to the forest manager? There are few options available to adapt the forest management in the Panagyurishte to a changing climate. One is to support the increasing of the share of more drought tolerant species as Turkey oak, despite the less valuable timber production of it. Another potential measure is to implement more intensive regeneration treatments on mature coppice stands. This would respond to two important management goals – to convert coppice oaks stands in to high ones and to establish young, high forests stands, which theoretically would be more flexible to environmental changes. From the other side, the competition of new stumping sprouts after the regeneration felling is an important ecological and economic obstacle, which might frustrate the transformation. We may expect that more stands in the future will own mixed origin. The problem with the total timber productivity of the future stands should not be underestimated as well. Reducing the fire risk means more intensive thinning, as well as diminishing the share of pure conifer plantations. These measures could meet some economic obstacles, since many of them are not profitable. Finally, the strictly even age structure of the current existing stands favors its occurrence again in to next generations. Generally pure, even age stands with simple (homogeneous) spatial structure are less resilient to different stress factors. The establishing of a more heterogeneous stands structure needs longer time and additional financial and human resources, which will reduce the implementation of these treatments. The adaptive management scenario (AM) includes silvicultural treatments which are convenient, well-known and possible according to both the expert opinions and legal management conceptions. They include shortening the rotation age of the coppice stands for conversion in to high and relatively intensive tending and thinning in to young stands. What do the AM projections predict about? Volume stock per hectare of the stands. Tree species composition and stands origin: In all climate scenarios, adaptive management scenarios determine higher share of high forests in the case study area in comparison with current practice (BAU). More intensive regeneration felling according to AM will lead to increasing the areas of young stands dominated by trees of seed origin in short to mid-term outlooks. 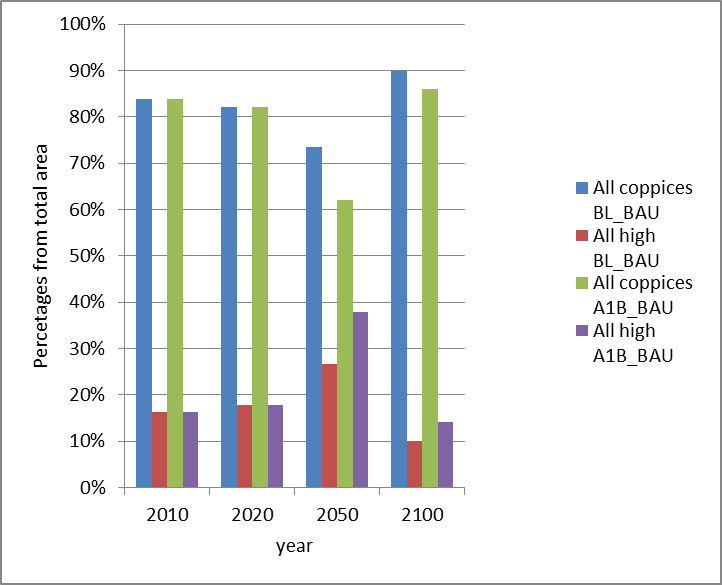 Long-term projections predict back-turn to coppice dominate origin of the existing stands. The share of the most adaptive Turkey oak increase faster in short-term run replacing more often Sessile oak and pine. Important conclusion of the long-term projection is that the conception of total conversion of the coppice oak stands will not be fulfilled, never than the less AM scenario promotes higher future share of high forests, than BAU. 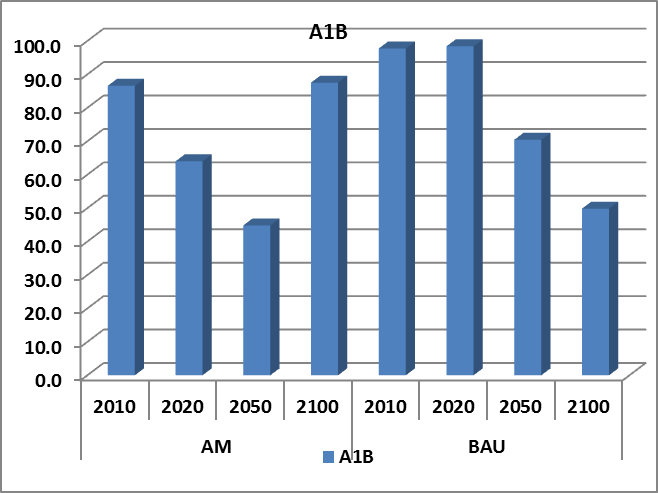 Stands growth and potential timber harvest: Potential timber harvest will decrease during the projection time, since the main annual increment decreases for both AM and BAU scenarios and both coppice and high stands. AM management require urgent, short-term harvest in all coppice stands, which will decrease considerably after 2020. This rises the potential problem concerning the lack of ability of the stands to supply the timber demand in mid and long-term outlook, if assumed that it will keep the current level. From the other hand the risk of men-caused fires will diminish since less human activities will be possible in more dense young forests. Volume stock per hectare of the stands: AM promotes the relatively intensive and steady decrease of the standing volume per hectare of the existing forests in short and middle term period for all stands. This connects to the more intensive regeneration felling in the short-term run for oaks stands. The total area of the pure pine stand decreases since native species (oaks) become dominants. In the long term perspective the AM scenario supports higher volume stock in comparison with the BAU for all oaks stands. The projections represent volume per hectare in the end of the century equal to the current one. In a few words, the AM promotes ability of the future coppice oaks stands to produce and support aboveground biomass, like coppice forest today. This mean that the stands will be similar to the current ones and will consist from closed forests and they could guarantee their protective and other environmental services, despite the low timber production and supply. see also this FAQ (especially the figures). 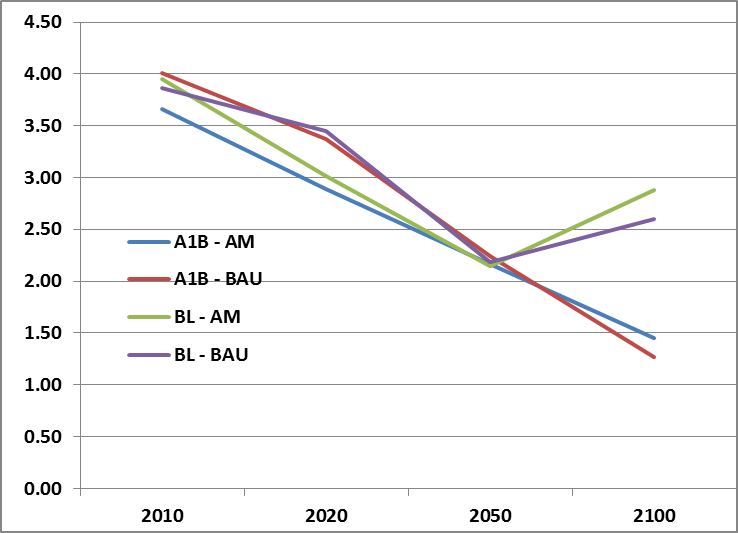 For a summary of the results and differences between the AM and the BAU scenarios see Table BG-3. Table BG-3.Comparison between the AM and the BAU management concerning legal management goals, related to different forest ecosystem functions in the Panagyurishte case-study (+ positive impacts, – negative impacts, ~ indifferent). These should lead to changes in long-term goals and traditional expectations from these forests. How did you come to your conclusion(s)? Which tools and methods did you employ? The scenarios and recommendation for the Panagyurishte case-study area are defined on the basis of expert opinions of the foresters involved in different management levels, as well as the present legal framework and stakeholder preferences. The dynamic forest ecosystem model PICUS v1.5 has been employed for the scenario simulations. An additional new module for simulation the stumps sprouting after felling has been developed. A set of indicators representing the demanded ecosystem services (an examples are given in Tables 1 and 3) was fed by model output and subsequently used to analyse the interrelationships of initial forest state, management concepts including assumptions about management intensity and climate conditions. Which obstacles limit the implementation of the adaptive management? Even the adaptive management activities are not able to fullfil some of the negative consequences of the predicted by climate scenarios changes. This could raise negativism between the stakeholders, which have to implement some restrictions or nonprofitable measures. 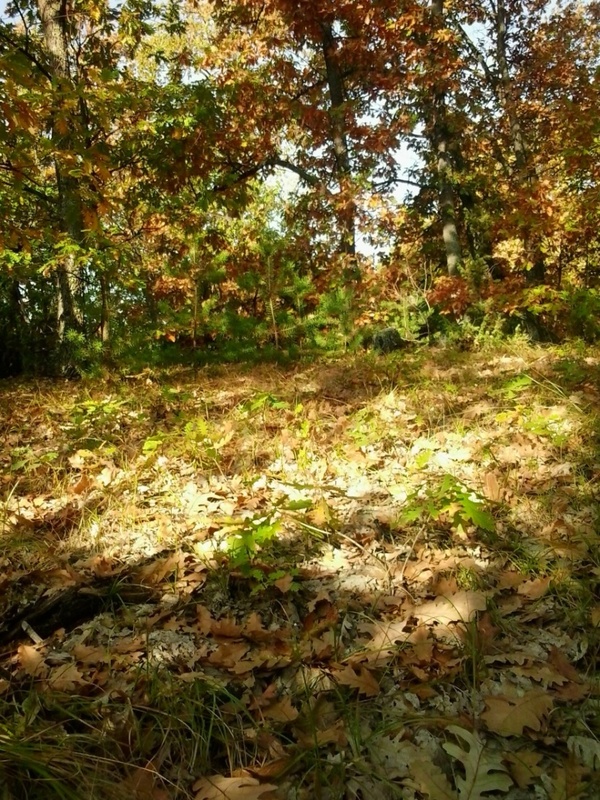 The possible unpredictable behavior of the great number of small private forest owners as well as the relatively weak capacity of the municipal forest managers could lead to short term interventions in some stands (clear cuts, overgrazing, over thinning, planting of non adequate species and so on. ), with long-term negative impact. The existing standards of the forest inventory and planning have also to be adjusted to the recommended adaption measures. The dissemination of knowledge, as well as the active information flows to all potential stakeholders (mainly the local citizens) and decision makers should be disposed to overcome these possible obstacles. This project is supported by the European Commission under the Environment (including climate change) Theme of the 7th Framework Programme for Research and Technological Development. The AFM-Toolbox is hosted by the University of Natural Resources and Life Sciences, Vienna.